Folks! it has been a long time since Endless Abilities has been in the lime light, but we are back and ready for a summer as exciting as when we embarked on our filming tour across the country in '12. Since last year, when our heap of digital files began to resemble a film, we have been taking every opportunity to connect with the people and spread our message of Endless Abilities. Since the first cut last summer, Endless Abilities has come so far and will be ready for YOU, the audience, this summer. Four years ago we had a goal to bring a short video to Spaulding Rehabilitation Hospital in Boston, to hopefully inspire a few patients; what happened, was so much more. The "short video" became a feature length documentary, and the "few patients" became People. The "people" we affected, and/or connected with, can not be classified by any one demographic. Endless Abilities breaks the barrier of race, gender, age, and disability, and connects with everyone to show us all that we have the ability to adapt, and the ability to live. So get STOKED!! and stay tuned for the premier date, and our out door venue in Newport for our hometown premier, to be announced soon. I can remember as a child riding my bike down to my friend Erick’s house where we would spend the late afternoon hours hanging down by the Dock of the pond he lived on. Afternoons at Barbers pond are now some of the most peaceful memories of my childhood. As we grew up, we found a path that went from Barbers about a mile or two back in the woods, to a huge secluded lake that we named Secret Beach. I once had a dream that we explored even further past Secret beach and found an even more spectacular place. A place with a mystical aura that leaked from the ground we hiked on. For the longest time I knew that a place like that must exist, but until about a week ago I did not know where. When we finally made it to California after seeing the whole country, it was unlike any other CA experience I have ever had. Years since that childhood dream of the mystical land Erick and I discovered past Secret Beach, I finally found the place I had only dreamed about. Yosemite. Words cannot describe the feeling of seeing a land that you had been to before only in your dreams. We entered Yosemite through the East and had climbed to 10,000 ft before sunset. Yosemite welcomed us back to California with open arms and a kiss of fresh air. We had made it. First on the filming agenda, after we rejuvenated for a night in Yosemite, was our meeting with Victor Pineda in Berkley Ca. Victor invited us to his office at the Ed Roberts Campus, a disability civil rights hub. Victor told us all about the progression of the ADA and the progression of civil rights for those with a disability. He is a world leader in disability policy and planning. We spent a few nights catching up with work and enjoyed the comfort supplied to us from our awesome hosts, friends, and family, the Elliot’s in Mill Valley. Despite being 3,000 miles from home, staying with the Elliot’s gave us our first real “home” feeling on the west coast. After an amazing dinner prepared by Tripp’s aunt Erin, the Elliot’s and the EA crew walked into the Mill Valley Village and experienced another taste of home when we saw the Wes Anderson film Tripp worked on last summer, Moonrise Kingdom, which was filmed in our home towns in Rhode Island. I never thought that coming back to California would be such an awesome experience, but coming through Yosemite and straight to the bay area where we had great hosts really set the tone for what we know is going to be an awesome grand finale to the trip of our life times. Fish Tacos - What more could you want? 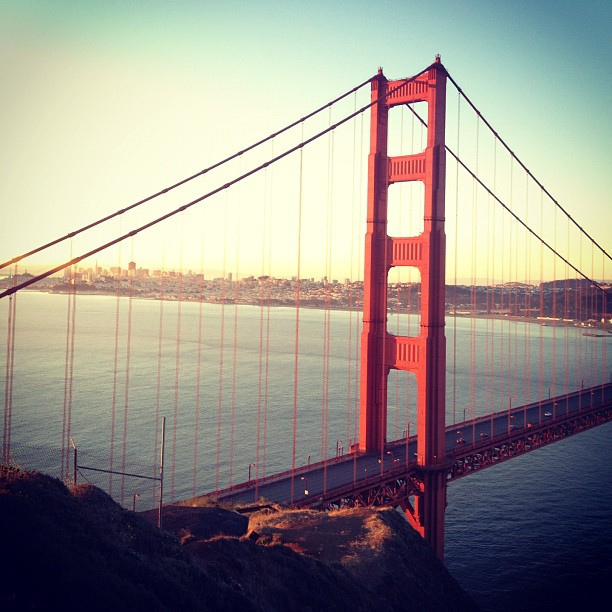 Sunset at the Golden Gate Bridge. I honestly thought, waking up the morning of our last day in CO, that I would be bummed out leaving. Admittidley, I was a tad bummed since I had the time of my life in CO and met some amazing people ( you know who you are), but as soon as we entered the Rockies again to head west form Denver it was hard to be bummed out. We all got really excited when we started our Ascent toward the continental divide and it began to hale. It was pretty neat to see mountains like Love Land, Vail, and Copper. Once Past Aspen we began to enter the most amazing canyons. We were all in awe for about an hour as we drove along the Colorado on I 70 with 100 ft plus walls on either side of us. After a short nap (about 2 hrs), we were pulling of I 70 to drive off the beaten path to Moab, UT. For about an hour we descended into the canyons along the Colorado River that leads to Moab and Arches National Park. We then settled into our campground and I cooked the guys a hearty dinner of gourmet beef and salmon burgers on our trusty grill. I personally fell into a deep sleep dreaming about the next morning. In my dream I remember lying in the bus while Tripp drove us deeper into the desert to find the perfect arch for our sunrise shot. The navigation became confused and the dialogue between Tripp and Will more hesitant. Then I was bounced out of my bed as the Bus had driven off the road. The door had opened a few times with Will coming in and out, as the sound of the tires digging trenches in the dirt off the side of the road smacked against me under the floor of where I was trying to continue to sleep. When Will came back in the final time and said, "yea we're not going anywhere for a while" I then looked up and saw Harvey rising out of bed. It was then I realized that about twenty minutes earlier Tripp and Will had attempted to drive us to the arches when they inadvertently got us stuck off in a ditch. And it was not a dream after all, but that we really were stuck in the middle of nowhere. Everyone was a bit frazzled, but we began coming up with potential solutions. After a while wouldn't you know that Canada's nicest couple found us and were eager to lend a hand. After an attempt that snapped two ropes, they headed to town to buy a chain. Before they got back a park ranger had found us and was able to get a tow truck out there to save us. 4 hrs after we had driven of the road we were back on track. Our little mishap did not deter us from continuing on to see the beauty of Arches National Park. We found our perfect arch, and started up the path that lead underneath it. As I began to climb the spaced out stairs alone, the Park's media team asked to photograph us for the website. Then the guys carried me up the remaining 200 plus stairs that became unmanageable. It was a valiant group effort that was so worth it. Underneath the Arch was an incredible feeling that was the perfect end to a sideways morning. The trip down was completely independent. It was really neat to see peoples reaction to a wheelchair being up there, and there could not have been any other experience that expressed our camaraderie more. We brought tears to one lady who was completely overwhelmed by the Arches natural beauty and our presence there. Even though it turned out to be an incredible experience we will all always refer to our Moab experience as "Moab Mo Problems"
Two days from now will mark the middle of our epic journey. The past two weeks alone have blurred together with consecutive 18-hour days. We have blown out tires in the middle of nowhere in Illinois, drove 600 miles out of the way to Chicago to meet with our friend Anjali, our official project mentor, only to find out that we would miss her due to flight complications. Then we met a man practicing in Buddhism in an elevator that took one look at us in and said “what’s up with the wheelchair” when I answered, “a Dirt bike accident” he simply replied to me, “well that is interesting!” then said to all of us “ well good luck on your journey, your doing great things”. We all looked at each other in awe. How could this perfect stranger see so much in us in only 35 seconds and a dialogue consisting of 25 words? We are completely amazed at the incredible hosts thus far in our trip. Four of which have been complete strangers to all but one of us. Each and every host has brought us in with open arms and made their home ours for the duration of our stays. In Chicago we stayed with Will’s extended family, who instantly became family to all of us. Although we missed Anjali due to flight complications, Will’s Uncle Sandy introduced us to Dare To Tri, a program that we had competed against to win our grant through the Hartford. It was an honor to include them in our journey and to take part in one of their events. Dare to Tri was a perfect way to fill lost time with Anjali. When we left Chicago we ambitiously started the trek across the plains to Denver, stopping with an awesome family in Des Moines who fueled us with a sound nights sleep, a hearty breakfast, and a beautiful duet on the piano before we left. We then slept in a Walmart parking lot before making our way to the swanky room at the Denver Marriot, which was significantly discounted thanks to our next host Craig Hospital. I will never say what is the best stop of this trip because each experience has brought something totally different to the film. I can say that our visit to Craig Hospital in Denver was, for me, one of the most powerful experiences so far. Craig hospital is an incredible hospital that completely impressed me. Their emphasis on community and recreation makes this facility incomparable to any other I have known in the past nine years. After several interviews with staff and patients, making a presentation and showing our trailer, I played a game of basketball with a young man that missed our presentation. He asked me if I was a patient and then when I told him why I was there he asked his mother and father to pull up Endless Abilities on there tablet. While spending a half an hour with this young man and his family I could see their sense of hope brighten. It was an amazing feeling for us to offer hope directly to people who are in the same shoes that I was in nine years ago. Meeting and staying in contact with a cute staff member is pretty neat too! In Denver we also met with National Sports Center for the Disabled who is based in Denver and in Winter Park, CO. After meeting with Hal O’Leary, NSCD’s founder, and his incredible staff, we drove to their Winter Park location to take part in their favorite summer sport, rafting. Despite low water levels on the Colorado, today could not have been any better. Our guides became best friends and two AmeriCorps volunteers offered to save us a ride back to Denver and accommodated us in NSCD’s amazing condo at Winter Park. The four of us, and the 10 AmeriCorp Volunteers, all went out for drinks and dinner to watch our beloved Celtics lose their second playoff game. Despite the loss it was a fantastic game and the day had been so amazing that it was hard to be down about it. Next stop is Utah, where we still have our fingers crossed to meet and bike with Chris Waddell of One Revolution. So far, everything has been incredible and we are looking forward to our surf trip in California. One big additional thanks to Denver's ABC7 for hosting us live and letting us share our story than the people we saw in person. We assume that all the beeps and waves we got in CO were due to your segment on our Endless Abilities. I think all four of us were really surprised at what a great stop St Louis, MO ended up being. We arrived on Friday night (may 18), and we're greeted with firm hugs from our host and the founder of DASA as well asGateway Games, Kelly Bellman. In the past few years Kelly has brought a small congregation of few disabled youths that would gather for activities in her back yard to over four hundred athletes that compete in various sports, from swimming to skiing, year round. When we arrived on Friday we filmed the last practice before the weekends event. We were able to profile amazing young athletes and the positive effect that DASA has on them and their families. We also proved to ourselves and ultimately to our audience that it does not matter where your live there are always means to stay active regardless of your disability. In addition to the Gateway Games we were able to catch up with the SledHockey National Champions, the DASA Blues. We all owe a big thank you to Kelly for covering the cost or our hotel and most of our meals; Also to Thomas Re ed, a DASA parent, who offered to take us all out to breakfast for our first day. The DASA community like all of our other hosts went above and beyond in their accommodations. Looking forward to the exposure of competitive youths with disabilities in our final cut through DAS A's part in the film. So long St. Louis it's been real! Yesterday our cameras finally caught Zack out of his comfort zone. We departed Baltimore bright and early Pittsburgh bound to meet our new friend Johnny Stark. Johnny had reached out to us about two months ago explaining how the past three years of his SCI has been a total blast. We arrived just outside Pittsburgh where Johnny introduced us to the Mighty Penguin sled hockey team . Despite living in Rhode Island, a hockey hotbed, for his whole life Zack was like a fish out of water to begin the practice. Despite looking the part ( Zack is kind of a burley mountain man’ish looking fellow) He could barely steer his sled. Never-the-less he surprised himself by having a blast for the short time we had the ice. After the sled hockey practice we headed down some beautiful Western Pennsylvania country roads during sunset on our way to our Pittsburgh host, Kathy Laffy. Two nights before we arrived in the Pittsburgh area we did not even know who Kathy was; she was recommended to us by Kirk Bauer of DSUSA who we interviewed on Sunday. Despite being complete strangers we greeted each other as if we were long lost friends. Kathy has been working with Kirk and DSUSA for 30 years and could not have been more enthusiastic about hosting us with a meal, some drinks, and a pre-bedtime jacuzzi session. Today Kathy made sure we were fed a hearty breakfast before our departure. Before we skipped out of Pennsylvania we met up with Johnny Sparks again, this time at his local skate park where the Mighty Penguins’ Coach Ray joined us while Johnny shredded up the park for our cameras. He even let Zack try out his chair and was really stoked when Zack dove right into it bye jumping stairs and dropping into the bowl with no prior experience. For the afternoon we drove through Pittsburgh in bumper to bumper traffic which was a perfect time to grab some b roll shots of downtown. We topped of the day bye meeting a car full of super cute girls who were totally intrigued by us. We were able to hand them Endless Abilities bumper stickers while they were right next to us in the tunnel leaving the city. We basically just had a dance party during the whole traffic jam, something the other travelers were really amused by. What a blast! The perfect way to begin our 600 plus mile journey to St. Louis. Day 2 and 3: This morning we departed Hartford, CT for Baltimore, MD where we met with Kirk Bauer. Kirk is Disabled Sports USA director and invited us into his home to shed some light to us in regards to DSUSA. Kirk is himself an amazing individual and a perfect fit for the postition which he holds in the world of adaptive sports. 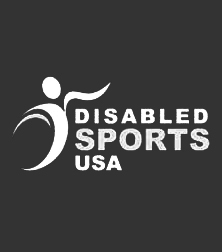 DSUSA was created in 1967 by a group of like minded war vets who wanted to live and promote active athletic lives and life styles. Our interview with Kirk ended with a tour of his hiking bag which sat to his right during the whole interview. Kirk says his bag, which is packed and ready a month before his ascent of the Mt Mckinnely, is emptied daily and repacked just so he can be reassured that all the appropriate gear is there for his attack on the United States largest mountain. Meeting with Kirk first was a great opportunity as DSUSA is the governing body of over 100 chapters of Adaptive Recreation organizations throughout the country, some of which we will be visiting. They say your trip becomes an adventure not until something goes wrong. That philosophy is very helpful to keep in mind when thinks break, thus it was a little easier when the lift broke on us. Luckily, despite having to blow off time with the staff at the DSUSA office, We were able to get our lift back up and running. How much you ask? free.99. Loading the Bus for the first time. First day: After we finished packing we departed Newport, RI. Waving goodbye to our home we realized we could not have been blessed with better weather to start our journey. Our first day was spent in Hartford, CT with an amazing young women, Kristen Duquette. Kristen is a paralympic hopeful and an incredibly driven young women who was introduced to our film after we won the Hartford Insurance Achieve Without Limits Award. We have all gained not just another incredible subject in Kristen, but a great friend too. With all the incredible places for which we are bound I had no Idea that our first stop in our neighboring state would be so amazing. In addition to the beautiful day on the campus of Kristen’s College, We were treated like family at a dinner in the Duquette’s home. Kristens mother Dee could not have been more accomadating. Kristen’s coach left us with this great acronym to ponder for the rest of our trip. F.E.A.R: False expectations appearing real. Since Endless Abilities was born all four of us have never once underestimated the magnitude this project would have. Not only once completed, but throughout the whole process we knew we would have the opportunity to touch hearts and change lives. For me it has been the most amazing blessing to not only have finally met three guys that I know will be by my side as brothers for the rest of my life, but who also have been inspired to help me do something that I had always dreamed of; changing lives. We all developed an equal passion for this project and that is why we hit the ground running almost two years ago and never stopped to look back. Ever since I had been motivated to surf I always loved any opportunity to share with people the stories of those who inspired me to be “inspirational.” I felt that if they only knew the people who inspired me to do the things I do, they would look at me as just a normal guy doing what he loves. Nine years ago after my first year in a wheelchair I can remember feeling so alone. Despite tons of friends and endless family support, I was missing something. I could deal with having to adjust to sitting on the sideline at our football games, or having to rely on others for rides to and from school, but as time went bye I found myself in my senior year of high school with my best friend still laying in a coma from our accident. All the other kids had their one main man from childhood, their best friend, their other half, and all I could think about was that I was now alone. My brother lay lifeless in a hospital bed and while feeling responsible for all of it I knew there was nothing I could do for him. Despite all the fun times I had after my accident and all the adventures I had with my friends, I never thought that looming feeling of loss would ever elude me. Shortly after Will, Tripp, Harvey and I started Endless Abilities and 7 years after my accident I received a call from my friend Charlotte who was there the night of the accident. She told me, after seven years of a lifeless state, Timmy had passed. We all finally had a chance to mourn the tragedy of our friend. I will never forget telling Timmy’s parents that everything I do in my life will be done in part for their son. I will allow their son’s spirit to live through me and through the new brotherhood I now share with Will, Tripp, and Harvey. While they no longer get to touch, see or hear their son, they can know that he is apart of me and everything that we are now doing together as brothers with Endless Abilities. This week the Endless Abilities crew would like to thank everyone who has contributed to our success, in any way, for the past two years. Special thanks this week are due to all 302 backers who helped us reach our goal of 30k with Kickstarter. On March 20th we launched a very ambitious goal and ended it successfully a month later on April 20th having raised 104% of our goal! It is amazing to see how far an idea that was shared only amongst four friends has come in less than two years. When we first decided together that we would dedicate most of our lives for the next two years to Endless Abilities, we hit the ground running and never looked back. The first fall and winter we spent our own money beginning the process to develop our idea into a product. After six months of working with various communities throughout New England, we were ready to share with our friends, families, and all the communities involved what we were doing. So last June we had an amazing fundraiser in Narragansett, RI, raising just over $10,000. We then took that momentum into the fall when we applied for the Hartford grant, which ended up supplying us with $10,000. This past week we ended our Kickstarter campaign reaching $31,432, this puts us just over our goal of $50,000 that we had to meet by the time we leave for our summer tour in may. The bus we bought with the Hartford grant is just about done being converted for our trip, and we are beginning to see all of our hard work and planning come together right on time. From the day this project formed as an idea between four friends on a dock in Newport, RI, it has been destined for success. We are all so excited to depart and capture the compelling stories of those with physical disabilities across our country. We look forward to each and every visit along the way to Southern California, experiencing various adaptive activities. We invite all of our supporters, not only from our recent Kickstarter, but from the beginning, to another gathering at the Narragansett towers. Come enjoy Live Music, hors d'oeuvres, a cash bar with special deals, and congregate with all the other amazing people who are making Endless Abilities possible. You have officially put us in the position to carry out our dream of completing this film. Now we would like to see all of our supporters together before we leave. See you there on Thursday, May 10th at 6pm. Narragansett Towers. Three factors aligned my senior year in high school that changed my life forever. A friend of mine introduced me to an article about a guy from California who was dropping into 15 ft waves on his stomach. When I first read about Jesse Billauer, I learned that he was a quadriplegic who sustained his high level injury in a surfing accident at his home break in Zuma Beach, CA. The article in Transworld Surf Magazine instantly captivated me. Jesse grew up an avid competitor and accomplished surfer who was destined to become a pro. One day Jesse and his friends were surfing before school when he dropped into a massive shore-breaking wave. For those of you who don’t know surfing, that is a wave, which breaks in very, shallow water. Shore breaks are typically very fast, powerful, and steep. Only experienced short boarders even mess with shore breaks. Jesse could do it with his eyes closed, but on that particular day there was a freak occurrence. Dropping in he was thrown forward and dove head first into a sand bar. He sat in the water eventually being turned facedown before his friends miraculously found him. The photos that accompanied the article showed Jesse surfing after his accident at a famous Fijian spot called “Cloud Break.” There his friends helped him achieve his dream of getting “barreled” once again. After reading the article I then saw Jesse in the great surf movie, “Step into Liquid,” Jesse became my hero and fueled me in my mission to get back on the waves. I spent that winter browsing the Internet for resources that were available to disabled athletes, eventually finding the Challenged Athletes Foundation. CAF is a San Diego based organization that works to provide support and opportunities to those with physical disabilities so they can pursue active lifestyles through physical fitness. CAF provides thousands of grants to disabled athletes across the country. No matter what level one wishes to perform at, CAF encourages everyone in they’re physical aspirations. A year after seeing that guy out on his wave ski, and months after finding CAF I was booking a ticket to Dana Point, CA where my new wave ski was waiting for me. Before I even filled out the application with CAF earlier that winter, I had told Steve Boehne from Infinity Surf Co. that he could start making my board and that I would be buying one with or without help from a grant. By the time April rolled around I had forgotten all about the grant application when I opened the mail box and was suddenly reminded of it when I opened an envelope from CAF which carried a check for the full amount of my new ski. Boehne was an awesome guy, a total So Cal surf legend. He not only shaped me a ski for a discount, but also offered to host me for a week in his home so that I could learn to use my new ski with the best of them. My first impression of So Cal was exactly how I had always pictured it. After flying into San Diego, I hopped on the train to Orange County. For an hour the train swept through valleys and passed beautiful beaches and coastal villages. Finally I got of the train in San Juan Capistrano, a little beach side mission town. There I made my way from the train through a beautiful vine covered alleyway with brick walls on either side of me. Once through the alley I was on the main rd. I could smell the ocean and the So Cal aura was thrown in my face; From young guys who just got off work that were headed down to the beach to sneak in a dusk surf session to the seventeen year old blond Cali girl who was being carted around by her Abercrombie model boyfriend in a convertible Porsche 911. I had made it and from that moment on I would never be the same again. With two huge bags and a dead cell phone I made my way to the address of the Infinity shop. The bus brought me as far as the bottom of the massive hill that I ended up having to wheel up. I was determined. Once at the top I found a little tiki style Mexican restaurant called Taco Surf. It was the original Hobie surfboard factory, which looked over the Dana Point harbor. I figured it would be a great spot to plug my phone in and call Boehne. The second I entered the place, the last thing I expected to hear was someone calling my name. It was Boehne. “You must be Zack, how did you know where to find us.” I told him I was stopping in for a drink and to charge my phone to call him. Steve introduced me to some great people that week, everyday we would rise at 5 am and were at the beach by 5:45. Boehne was the unofficial mayor of San Onofre state beach, and I learned my new sport in the best possible environment. A week later, when I returned home with my new ski, I brought back a piece of California in my heart. Something I never plan on returning. April 29th, 2003 felt like any other beautiful spring day in Rhode Island. Little did I know that morning when I woke up and drove my car to the beach instead of my first period class, that it would be the last time I would ever feel the warm sun soaked sand under my feet. And that night, when I think back to the conversation I was having with my best friend Tim just before we took off for a little harmless ride on a dirt bike, which we had done countless times before, I never imagined it would be the last time I would ever hear my best friend’s voice. The accident resulted with me facing the rest of my life in a wheelchair, which I initially thought would be impossible without the help of my best friend and brother. Words cannot express the emotions that I lived with for that first year so please forgive me for not even trying to convey them. As time passed it became easier to see that life had to go on, yet still I had no idea how. A year from the day that the accident happened my friend Eddy and were talking in our last period class when he said, “dude there’s waves today!” obviously forgetting about my wheelchair. I said to him, “thanks for rubbing it in, Eddy.” So he and I went to the beach just to watch the waves. I may not have known it at the time, but that trip to the beach to watch my peers all enjoy something that I thought I never would again, ended up changing my life. I sat on the sea wall and watched one particular fellow surf sitting down with a paddle in his hand. He caught and surfed waves just as gracefully as anyone else in the water with him. If there was any difference it was that he was catching more waves, surfing them longer, and having more fun. I sat for nearly two hours watching him and waiting for him to come out of the water. I knew that I needed to find out how I could be doing this. Until next week I leave you with this link, please support Endless Abilities by checking it out and sharing with all you friends and family. In a series of about three posts I wish to help you understand what surfing means to me, what it has done throughout my life to develop me as an individual, where it has brought me, and where it will take me into the future. By the end you will know exactly why my heart is in this project 100%. Falling in love with the ocean for some is inevitable. The salt is in our blood, the fresh smell of the sea always in our mind, it’s our sanctuary. And when we are there we are free from the rest of the word, all that matters is the serenity which is instilled in our souls anytime we are there. As far back as I can remember I have been a salty, soggy Rhode Island beach bum. Whether Island hopping around New England waters with my sister and parents, sitting for hours on the bow of our sailboat watching the land on the horizon appear and disappear until we landed at destinations like Block Island, Cape Cod, Cuttyhunk, or Martha’s Vineyard, or trudging around the bulkheads of the marinas at low tide collecting buckets of crabs and starfish while my father worked on our beloved 32’ Seafarer, Elysium. During the summer weekdays my mother would pack our beach mobile, a ’65 mustang convertible, with snacks, lemonade, boogie boards, skim boards and surf boards, myself, my sister and any one of our friends or cousins who was around and we would stay at the beach almost until the sun was gone. My summer memories live in my heart forever, and every summer I am right back in the shoes of that same young boy who was born with a love for the ocean. I remember when my father first pushed me into a wave on a 6’ short board, which floated me while standing on it in one place when we would wait for the best sets. When I was about nine I started paddling into the waves myself on that same board, and then I was truly stoked. Ever since, I have found solace in the dawn of each summer. When the days get longer and warmer an overwhelming energy manifests in my heart and the ocean beckons. Through all of the hardest times in life surfing has been there for me. When my parents divorced, my father would drop me at the beach on a Monday morning after spending the weekend at his house, and until my mother picked me up in the afternoon I could elude all sorrow and pain from the horrible situation that became of their relationship. Through the trials of my teenage years and dealing with two new families, I was nurtured by the ocean. After loosing my best friend and father, waiting for waves during a surf session became even more spiritual. Throughout my life surfing has molded me into the person who I am today. So it makes perfect sense, that after becoming a paraplegic, surfing would help me survive and accept my new life just as it had always done.